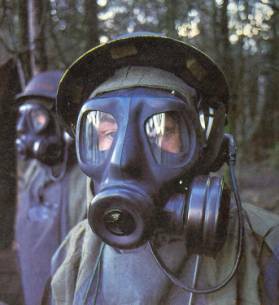 The British S6 NBC Respirator was the protective gas mask issued to the British armed forces from the 1960's until the introduction of the current-issue S10 in 1986, after which it was withdrawn from service. The S6 was developed by the Defence Science and Technology Laboratory, Porton Down from the 1950s and manufactured by the Birmingham & Leyland Rubber Company. Although made obsolete by the S10, production of the S6 continued in Turkey after the adoption of the new mask by the British forces. 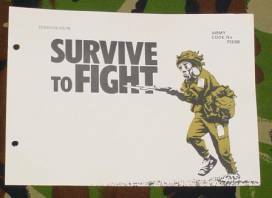 CDE at Porton Down also developed a S8 respirator but it never went into production. The S6 features an adjustable air seal around the inside of the facepiece to improve fit and comfort of the mask, the pressure inside the seal can be adjusted by means of a tap inside the nosecup, which helps to reduce fogging on the inside of the eye pieces. The S6 was made in three sizes (although an extra-small RH facepiece was added in 1978), and had a shelf life of twenty years. 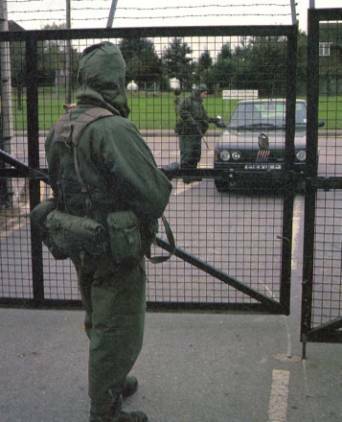 The S6 was the first in a line of modern NBC protective masks developed at Porton Down. 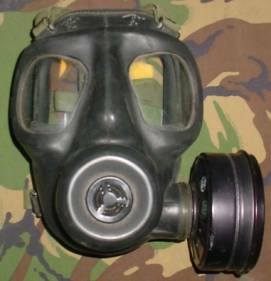 The gas mask was made of soft black rubber, with an inner peripheral face seal making the mask very comfortable to wear. A 40mm threaded filter NBC canister was attached to the side of the face piece, and the mask came in both left and right handed versions, weighing 0.83kg with canister (A2 4240-99-135-3662). A combination exhale valve and speech diaphragm assembly was positioned on the front of the mask. A six strap elastic head harness was used for suspension. 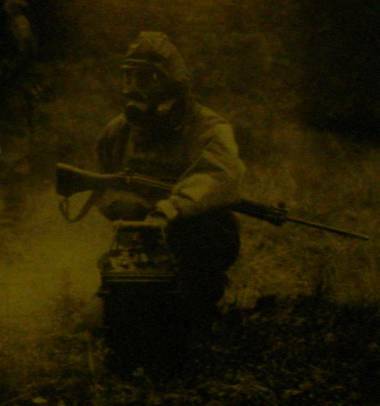 The S6 gas mask also incorporated an inner nose cup. ABC (Atomic, Biological & Chemical) suits were available to British Armed Forces from the mid 1950's. 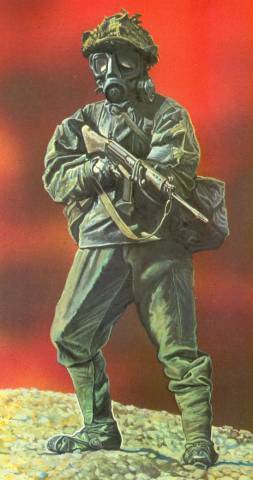 The designation "NBC" (Nuclear, Biological & Chemical) replaced "ABC" in the armed forces from the early 1960's, although the term "ABC" remained in use by the Civilian authorities until the early 1970's. 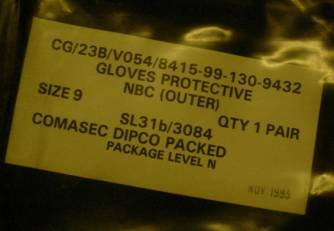 The first modern style NBC suit in general issue, was the "SUIT PROTECTIVE NBC No1 Mk2" (NSN 8415-99-122-6251/6252/6253) which came into service in 1967, but was replaced by the updated "SUIT PROTECTIVE NBC No1 Mk-III", in 1976. The "SUIT PROTECTIVE NBC No1 Mk-III", consisted of an olive green smock with an attached hood, and trousers, which was worn over the uniform with the webbing on the outside. The No1 Mk-III is supplied in four sizes to fit men from 1.5 to 1.9 metres in height plus special measures. 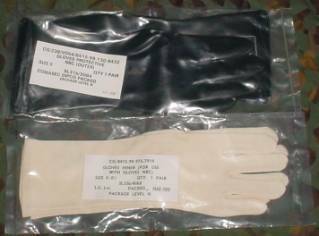 The suits can be repaired with issue repair kits which contain six self-adheasive pvc patches. The Mk-III smock had to be pulled over the head as there was no front opening, and was designed to allow the trapped air to move around unlike most NBC suits of various other nations. The suit is made up of two layers, the inner layer of charcoal impregnated cloth, and the outer layer, which is made from modacrylic and nylon, giving protection for up to 24 hours in a detected threat environment. It became known as a "Noddy suit" within the British Armed Forces. The No1 Mk-III is pressure and vacuum packed giving a shelf life of four years. Hand protection was by rubber outer gloves, with a cotten inner glove, to provide better sensitivity for the wearer. Foot protection was provided by rubber over boots, designed to be pulled over DMS boots, and secured with a lacing system. The overboots do not have a sizing system and are not left or right specific. 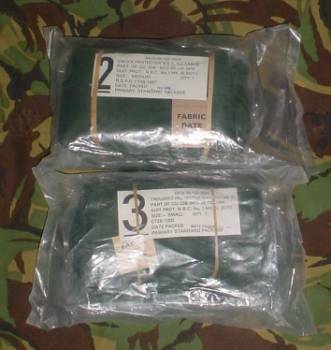 The British "SUIT PROTECTIVE NBC No1 Mk-IV", (which replaced the "SUIT PROTECTIVE NBC No1 Mk-III" in 1986), NATO Stock Nunber 8415-98-130-6940, is reinforced nylon with charcoal impregnated felt. It is more comfortable because of the breathability but has a shorter useful life, and must be replaced often. 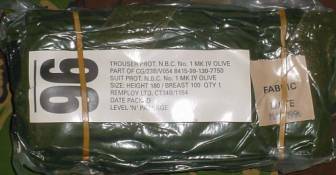 The No1 Mk-IV is pressure and vacuum packed giving a shelf life of six years. The SUIT PROTECTIVE NBC No1 Mk-IV is worn in conjunction with a respirator, gloves and overboots, and offers protection against all known chemical warfare (CW) agents. 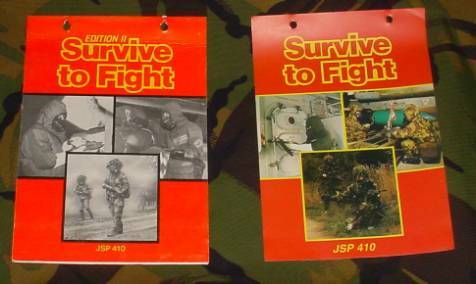 The life of the suit in operations depends on the level of attack. In most situations it can be worn for up to a month and still offer protection to the wearer. Under extreme conditions of multiple attack it may be necessary to change the suit after 24 hours. It is intended that the protective suit should be worn over normal clothing. In addition to providing protection against toxic agents in both liquid and vapour form, the suit is also self-decontaminating by encouraging rapid evaporation. Due to its flame retardent qualities, it offers a high level of protection not only against fire, but also against the thermal pulse resulting from a nuclear burst. The No1 Mk-IV is a two-piece suit which consists of a smock and trousers, available in five specific sizes, extra small to extra large in Olive Green or DPM. The suit is also available in "special fitting" in both Olive green and DPM. The smock, has a front opening which can be closed with a slide fastener and velcro tapes. It has an attached hood with an elasticated face opening, which gives a good seal around the respirator. Velcro strips are also provided at the cuffs and hips to allow easy individual adjustment for size. Bellows type pockets, with stitching penetrating only the outer layer of the main suit are provided on each breast and on the right sleeve, and a patch pocket with divisions for pens is fitted on the left upper sleeve. The trousers are of pyjama type with a gussetted front end with brace tapes sewn at the back, and loops at the front to give over-the-shoulder braces which can be tied at the front. Waist and the lower legs can be adjusted by velcro fasteners. Bellows type pockets are provided on each thigh, together with detector patches. Both smock and trousers are designed with the outer and inner layers of fabric constructed separately and only joined at the edges, reducing any potential of contamination ingress through the stitch holes. The complete suit is constructed from two layers. The outer material is made of monacrylic fibres reinforced with polyamide fibres. It has a strong, hard-wearing outside surface. A silicone treatment is applied to make the garments shower-proof, and to permit rapid spreading of liquid chemicals, which in turn speeds up evaporation. This reduces the loading on the second layer, whose main function is to act as chemical barrier. The inner fabric is based on activated charcoal as a means of protection against toxic gases and vapours. It is bonded to a non-woven fabric, which is flame retardant. A fluorocarbon finish is applied as an oil repellent, thus acting as a further barrier to toxic liquids. This combination of repellents represents a chemical barrier which is highly efficient, but remains, air permeable. This liquid control system formed by a wicking layer over an oil-repellent layer permits the incorporation of less charcoal than in other systems, which results in a lighter garment and smaller package size. 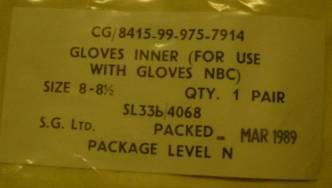 Gloves Protective NBC remained as the two separate layers, outer and inner gloves, which give three hours protection against liquid chemical agents, and longer if decontaminated within 15 minutes of exposure. NBC over-boots which are made of butyl rubber and can be worn over any Army issue boots. They provide 24 hours of protection against chemical contamination. Spare Canister (sealed): Internal pocket, right side. 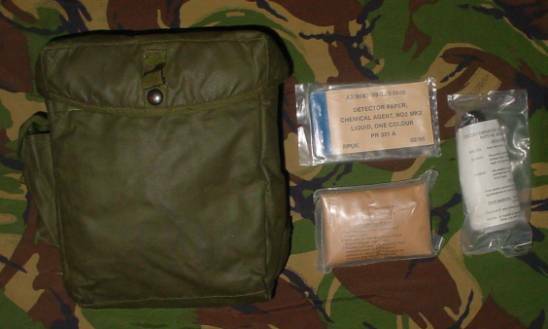 Kit Decontamination No1 Mk1 (DKP1): External pocket, left side. Kit Decontamination No2 Mk1 (DKP2): Internal pocket, front. Detector Paper No2 Mk1 Liquid One Colour: Internal pocket, front. Cloth Disinfecting: Internal pocket, front. Combopens: Individual pockets within Internal pocket, front. S6 Respirator: forehead down, canister over spare canister. 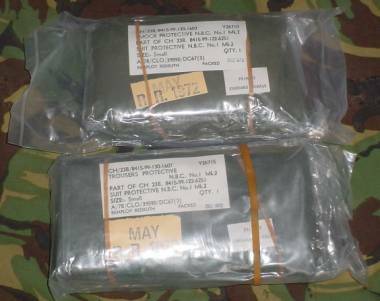 Nerve Agent Pre-treatment Set (NAPS): As per Standard Operating Procedures. 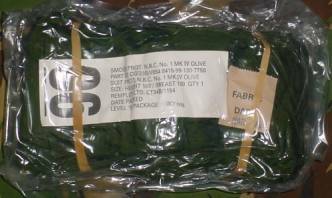 All items are issued in vacuum-sealed packaging, to protect them during storage and from NBC contamination. The grey detector paper: "Detector Paper, Chemical Agent, No2, Mk1, Liquid, One Colour" (A2 6665-99-220-4021), is attached at various points on the NBC suit. If a liquid chemical agent is present, navy blue spots appear on the detector paper. DKP1 (A2 4230-99-960-8415) is a cloth pad filled with "Fuller's Earth", a powder which will absorb liquid chemical agent, and retain it. A procedure of "Blot, Bang, Rub" is used for decontamination. The top of the pad is rapidly blotted on the contaminated area, then the pad is turned over and banged over the area to release the "Fuller's Earth" powder. The powder is then rubbed over the entire area. DKP2 (A2 4230-99-961-4239) is a plastic puffer bottle containing "Fuller's Earth" powder, which is suitable for decontaminating overboots and personal equipment. The puffer bottle allows you to blow "Fuller's Earth" into areas that cannot be reached by DKP1 pad. The powder is then rubbed over the area to be decontaminated using the DKP1 pad. The Radiacmeter Personal Locket Dosimeter uses a radiophotoluminiscent glass and pin diode in a lead lined nylon wrist locket. It is issued in a sealed, foil packet, marked "Do not open until operationally necessary". This is a non-self indicating dosimeter, it requires a dosimeter reader. 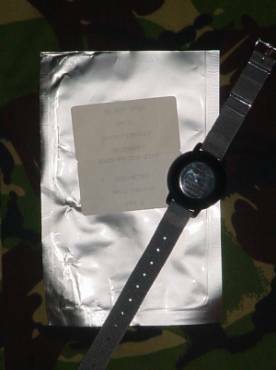 The dosimeter is worn like a wrist-watch on the outside cuff of the NBC smock, under the outer glove. It measures 0 - 1000 Roentgens and measures the total absorbed radiation dose of the wearer. It is not zeroed after each reading, so the individual is required to wear his/her own dosimeter, identified by the serial number on the back. NAIAD stands for Nerve Agent Immobilised enzyme Alarm Detector. It is a automatic alarm system which continually monitors the surrounding atmosphere to provide audible and visual warnings of the presence of nerve agents in either vapour or aerosol forms. The equipment consists of a sampling detector, which can provide it's own warning plus up to three remote alarm units, which can be up to 500 metres away. The system derives it's power from a standard 3.3Ah Clansman battery.